Based on the memoirs of the oldest Seer, and many thousands of independent eye-witness accounts, The 13th Day dramatizes the TRUE story of three young shepherds who experienced six apparitions with a “..Lady from Heaven” between May and October 1917, which culminated into the final prophesized Miracle. The lady, who revealed herself to be the Blessed Mary, gave a SECRET to the children told in three parts, from a harrowing vision of hell, to prophetic warnings of future events including the advent and timing of the Second World War, the spread of communism, and the assassination of the Pope. All three have since died. Two have since been beatified. Stylistically beautiful and technically innovative, writer-directors Ian & Dominic Higgins use state-of-the-art digital effects to create stunning images of the Visions and the final miracle that have never before been fully realized. 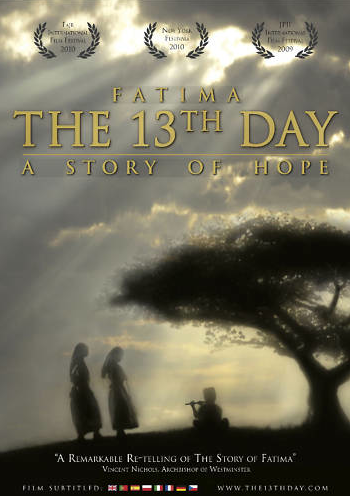 The 13th Day has previously been released in Oct 2009, the re-release is due to the addtional multi lingual version. We are reaching out to the WORLD!!! !